In the past three years, we had never sailed more than four miles from the launch on South Twin Lake. By the time the rest of our lakes are rotting out in March, this little gem is still strong. Right up to the edge. We’ve looked north from that undulating frozen edge many times hoping someday to get there. Today was the day. Curtis and I stopped for a gam at the little island that marks the extent of our usual plate and agreed that if we took it slow and kept a sharp eye we could proceed. Another couple of miles to windward and we could see for miles in two directions, Pemadumcook to the west and Ambajesus in the east, everything punctuated by islands and bays. In the near distance, Mt. Kahtadin and her brood of lesser peaks were all white and aglow under the one spot of clear sky. I reached over to a lone fish shack for some local knowledge and before I had the brake on, a jolly fellow came out to say hello. He knew the lake well, and told us that the worse spot is the way we’d just come! Where the lake (a river, actually) narrows at that little island the flow is intensified often creating weak ice. But today the water level was high, the flow slow, and the ice generally 18″. Rick, from the lodge, concurred with that observation when we met him later in the day. He came out to find us because Steve Madden had called and the North Americans are looking, yet again, for a venue. Anyway, Dave the fisherman directed us around a distant point into Ambajejus Lake to a small logging museum. 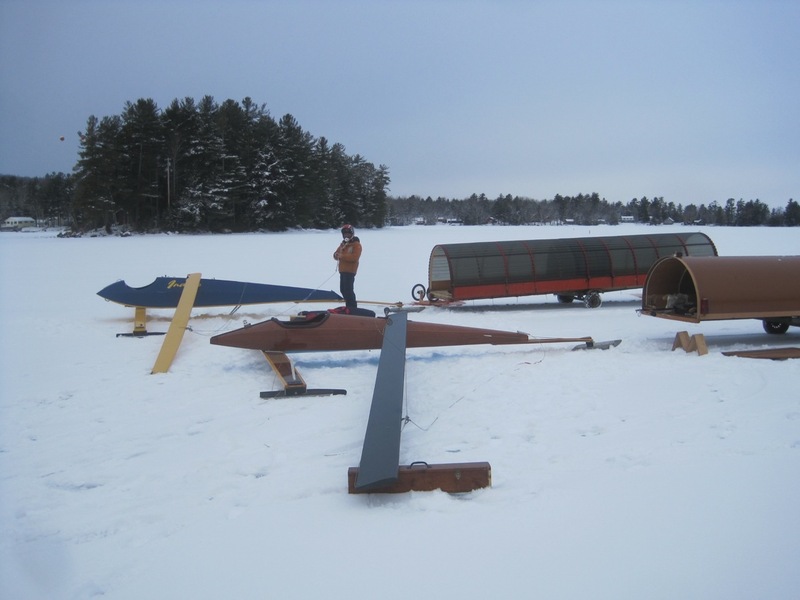 The only way in there is by boat or snowmobile, and I have a hunch we were the first ever to visit on iceboats. We short tacked up the near side as this is where the west branch of the Penobscot River enters, hence the “Boom House”. They would yard the booms in this very bay, four thousand cords each. The logs would come tumbling down the Penobscot on the spring run-off into a big loop of floating cable. As soon as it was full it would be towed to Millinocket and the next one made ready. This is all wonderfully documented in the Boom House with artifacts, photos, and indeed in the house itself. It’s preserved pretty much as it was left when the last boom was towed away in 1971. The doors are always open, and they ask for a small donation for maintenance. We ate lunch at the long kitchen table surrounded by the early twentieth century. It was a deep and lazy run back south in the afternoon. Keeping boatspeed down was the order of the day. Old snow drifts had wet out but never leveled, instead forming four to eight inch ice waves. There was no way around them and I couldn’t help wondering what happens when a springboard breaks. Then there was the shell ice, as if there wasn’t enough noise from smashing and crashing over the waves. All covered in a lovely two inches of dry powder. The fact that we sailed nearly forty miles in this stuff and didn’t break a boat is something of a miracle. If not for the waves, we’d still be there and spend the week exploring all the rest of this captivating lake system. And for all you local guys who haven’t been there yet, it’s only 2.5 hours from Camden. Still waiting for photos from the photographer, meanwhile here’s all I got.